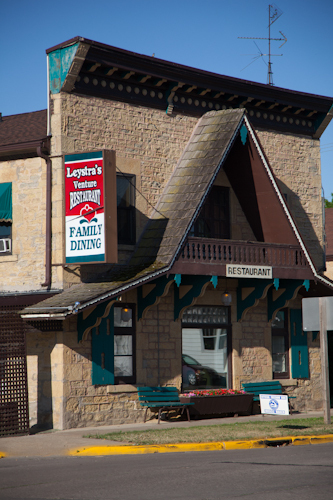 The town of Baraboo is close to Devil's Lake State Park, so it's convenient to stop in for a meal instead of breaking out the camp stove again. And since the town is pretty easy to navigate, finding Baraboo restaurants isn't difficult. But which one do you choose? Ah, there's the rub. Here's our mini-guide to some of our favorite Baraboo restaurants, and some others you might visit in the greater Devil's Lake area (Merrimac, Lodi, Praire du Sac, Wisconsin Dells). You may not a find a better beer list in all of Wisconsin - seriously. Amber, the Barn's lovely proprietor, is serious about malted beverages and keeps eight kegs on hand, swapping them out nightly to keep options lively. And if you're not exactly sure what you want, a thick binder (aka The Bible) is on hand describing every bevvie available in the joint, and there are LOTS of them. Great ambiance both inside and outdoors, with occasional live music in the summertime. Climber-friendly! Your quintessential diner transplanted from eastern cities to the Wisconsin heartland. Serving up American classics for breakfast, lunch, and dinner. The Disco Fries are a guilty pleasure. Serving up down-home, stick-to-your-ribs Wisconsin cooking since the 1930s, Jen's Alpine Cafe is a Baraboo institution. A family restaurant with a distinctive, historic character, Jen's fills you up for a reasonable price just off the square in downtown Baraboo. The vintage wooden booths might look like repurposed church pews, but they are actually a custom-built original installation from the '30s. Cool. Queen of Baraboo restaurants, Little Village is our favorite place to grab dinner. Founded on King Street in Madison (where the excellent Natt Spil currently resides), Little Village established a strong urban following, but relocated to Baraboo in the late 1990s. Friendly staff, good beer, and excellent food in a restored 1940's diner on the National Historic Register. Outdoor sidewalk dining is gorgeous on balmy summer evenings. Little Village isn't too big, so don't waltz in on a weekend evening expecting to sit down right away if you don't have reservations. Catch breakfast here on the way up from Madison. Reasonably priced baked goods and breakfast favorites in a family-owned, down-home establishment. Ask them to tell you the story behind the quirky name. Probably the "finest" local dining unless you go all the way to Madison. American fare, well treated, in the heart of downtown Wisconsin Dells. Prepare yourselves for a change of pace as you transition from natural Devil's Lake to the neon and glitz of downtown Wisconsin Dells. Semi-secret supper club catering to the Lake Wisconsin crowd. Lakeside dining on a quaint Lake Wisconsin peninsula, always hoppin' on a summer evening. Enjoy steak, fish, ribs, and lighter options on the big picnic tables out on the deck. Awesome. The Snack Shack is on the north side of Lake Wisconsin at the Merrimac Ferry landing, so most people hit it going home after a great day at the Lake. These guys used to do soft-serve, but now feature real ice cream in a great variety of flavors. A great way to kill a few minutes while waiting for your ship to come in.